The 1-GPM reverse osmosis portion of this system reduces operating costs by economically removing ~97% of the contaminants from the incoming tap water. 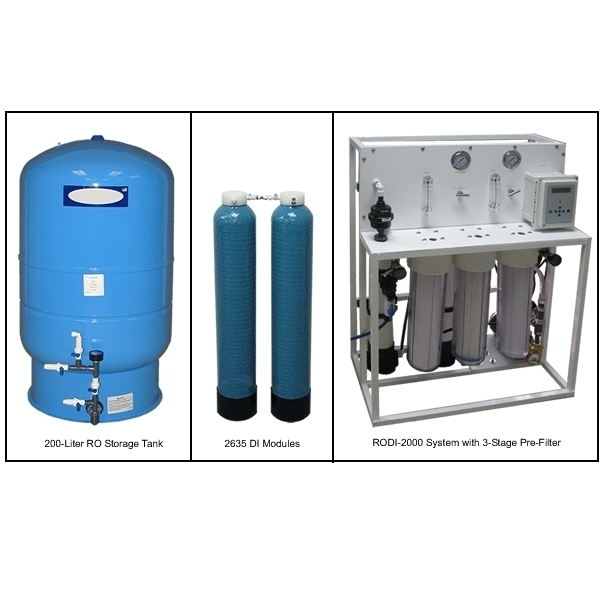 The RO water is stored in the included 200-Liter pressurized tank that prevents the risk of airborne contamination and eliminates the need for additional feed pumps and tank filters. The system is mounted on a welded aluminum frame and contains a built-in three stage pre-filter assembly. The Type I portion of this system produces 18.2 megohm-cm ultrapure, reagent grade water at a flow rate of 8-12 Liters/minute and features continuous recirculation to maintain maximum water purity. Therefore, pure water is instantly available on demand. The system can be setup to feed a single dispensing point or multiple dispensing points via a small (200 linear foot) circulation loop. A variety of optional faucets, valves, and dispensers are available for use with the system. A digital Conductivity/Resistivity monitor displays the water quality and a Green LED indicates that the water quality is above the acceptable purity. When the water quality drops below the desired purity, a Red LED alerts the user that it is time to replace the filters. This affordable lab water system is simple to install and easy to maintain. It features fully automatic operation, has a 1-year warranty, and is proudly made in the USA. A higher production 2-Gallon/minute versions of this system is also available (see Model: RODI-2000-03A). 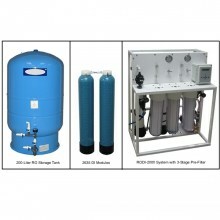 This combination Reverse Osmosis and Type I DI System is utilized in operations using virtually any quality tap water that contains less than 1000 PPM total dissolved solids. UV2006S8 UV Sterilizer - Prevents the growth of microorganisms within the system. I would like to request a quote for Type I High Flow/Capacity (8-12 LPM) RO+DI Systems.